Meetings are always a bit of a chore. One way to make up for the work aspect of such drudgery is to hold said meeting in the midst of beautiful surroundings. And that's what some of us did a week ago, when we convened to sketch out an upcoming conference. Randy Lakes was good enough to host us at his Adams County property, and plenty of good stuff lurked right outside the cabin door. The field above held some Rattlesnake-master, Eryngium yuccifolium, and numerous other botanical goodies. We were pleased to find the meadows full of these orchids, looking like floriferous confections. It is a Slender Lady's-tresses, Spiranthes lacera. They're not rare, but uncommon might fit, and this species has probably been recorded from one-third of Ohio's counties. Many orchids have boom years, and bust years, and it must have been boomtime in Adams County as we saw dozens of lady's-tresses. Orchids in the genus Spiranthes are very distinctive as a group, but pinning a specific name on one is not often as easy it might seem. A big division between groups of lady's-tresses is whether the plant has a single or a double spiral. This one clearly has the single spiral; the flowers wrap themselves up the stem like the stripe on a barber pole. Double-spiraled species have a much denser flowering spike. Spiranthes lacera has a lime-green cast to the inner flower. Like the rest of its brethren, the flowers look to be made from sugar, molded into impossibly contorted shapes. Another Adams County prairie, another Spiranthes. This one stumped me, at least initially, and I may still be wrong. There are better orchidophiles than I lurking out there in Cyberspace, and if one of you knows better, do tell. At first blush, the flowering spike of this one seems thicker, more densely flowered, perhaps one of the double-spiraled species. But, I don't think so. In most respects this species is very similar to the Spiranthes lacera in the first three photos. I think it is the so-called Northern Slender Lady's-tresses, Spiranthes lacera var. gracilis, which at times has been considered a distinct species. You know, to many people it really isn't THAT important what you call these things. They are perfectly satisfied with enjoying plants like this orchid purely for their intrinsic beauty, without being caught up in overly propeller-headed pursuits such as trying to pin a name on every darn thing. Halleluja, brother - who cares what its name is! An orchid such as this is always a pot at the end of the rainbow, no matter what you call it! The newest pink katydid, which goes by the name of "Pepto", is now a ward of the Center of Science and Industry (COSI) in Columbus, Ohio. We took her down there Friday, introduced her to the staff, and gave a briefing on what little we knew about the care and maintenance of pink katydids. We also armed them with lots of good info about katydids and singing insects. I really hope that Pepto lives a good, long life. In the realm of a katydid, that might be another month or two. For the brief period that I had her in my care, she was eating like a horse, a good sign to be sure. Pepto is especially fond of sunflower petals and leaves of plants in the rose family - not difficult fodder to obtain. 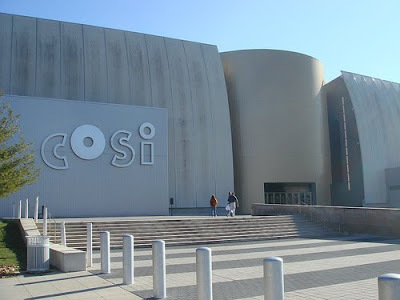 The entrance to COSI, in downtown Columbus. If you've not been here, it's well worth the visit. Scads of kids of all ages stream through the doors every day, and for as long as Pepto lasts, a great many of them will ooh and aah over her. The COSI staff have prepared a nicely decorated and sizeable cage for her, and three or four times a day she'll be trotted out to the masses, and be part of a science lesson on various animals. Thus, the seemingly inconsequential anomaly of a pink katydid will become a doorway for kids - and adults - to learn more about the natural world, and singing insects (Orthopterans) in particular. I just hope Pepto lives a good, long life! You may remember "Pinky", the charming fuchsia-colored katydid that made the pages of this blog back in July, here, here, and here. Not only was Pinky blogged about, the Internet went viral with pinkness as she was twittered and facebooked about, and ultimately featured in a number of newspaper articles. Several thousand people probably saw her image and read about her. Well, it paid off, as last Tuesday I got a call from Angela Johnson, proprietor of A Natural Place in the Hocking Hills. Angela's daughter had found another pink katydid, and they had remembered the newspaper articles about Pinky. In a fortuitous twist, I had to give a talk in Athens the following day, and the Johnson's place was just off the route that I had to take to get there. They were good enough to hand the beast over to me, and I am doing my best to provide luxuriant accommodations for Pinky II. This one is another female bush katydid, apparently of the genus Amblycorypha. Pinky I, you may recall, succumbed to the ravages of an internal parasitoid, the larvae of a Tachinid fly. The new pinkster shows no signs of being parasitized, is a full adult, and as we shall see, eats like a horse. Here she is - every bit as richly hued as her famous predecessor. We've got her housed in an aquarium loaded with a variety of fresh foliage, and she regularly wolfs down on various leaves and flower petals. In this shot, P II is making mincemeat of a sunflower petal. She really likes these. The insect is essentially completely and thoroughly pink, other than those odd oval-shaped bluish-white eyes. This video shows the modus operandi of pink katydid feeding methodology. Pink or green, they probably all eat like this; reminiscent of someone chewing corn off a cob. I am quite hopeful that Pinky II does well and survives for some time. If so, there may be some grand plans in her future. A bumble bee, genus Bombus. Mild-mannered but large and somewhat intimidating, most critters give them a wide berth. They can sting, you know. So, for the most part these big fuzzy bees bumble about the flower patch with impunity, not probably giving a lot of thought to danger. After all, who is going to tussle with one of these black and yellow behemoths? This. 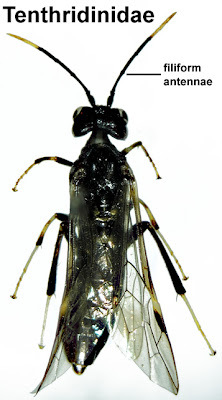 It's a Red-footed Cannibal Fly, Promachus hinei, and there are few insects higher up on the predator chain. As you can see, it has captured a bumble bee and is enjoying the fruits of its kill. If these things ever evolve to the size of Trumpeter Swans, I pity the humanoids that walk the earth in that grim future landscape. The consumate killer, this robber fly misses nothing and seemingly can take out nearly any other insect. I once saw an amazing photo of one that had captured an Eastern Pondhawk dragonfly. Well, pondhawks are pretty much the goshawks of the dragonfly world, routinely snagging and eating other dragonflies up to their own size if not larger. For a fly, of all things, to take one out is amazing. While exploring some Adams County prairies last Sunday, our group encountered several cannibal flies, but none so cool as this one. It was something to watch it lug that bee around, and after a bit of patient stalking, I was able to get my lens within a foot or so. It's perched on a Little Bluestem grass, Schizachyrium scoparium. The world of flies is indeed wacky, wonderful, and diverse in the extreme. They can be annoying, such as the common houseflies that haunt your garbage. Some are mimics extraordinaire, looking all the world like bees or wasps. Many are harmless pollinators of flowers. Some are dangerous and insidious death-dealers - parasitoids - laying their eggs on other insect hosts which will eventually be eaten alive by the larvae. Then there is this - the Red-footed Cannibal Fly. It gets my vote as King of Fly World, at least in these parts. While on the road to Chillicothe last Saturday, I succumbed to the irrestistable temptation to stop by and see a colony of Thirteen-lined Ground Squirrels that has long been a fixture in a place right off U.S. 23. It was bright and warm, and I knew the little prairie dogs would be in full whirl, digging, tussling, eating, and lazing about. Just south of Circleville lay the former Pickaway Plains prairie, and the best place to get an idea of what this place must have once looked like is to stop by Charlie's Pond and vicinity. Prairie remnants persist here and there, but a few years ago one of the landowners - who deserves a medal - put about 1,000 acres into prairie grasses, primarily Big Bluestem, Andropogon gerardii. It is impressive. The tall grasses stretch to the horizon in the above shot, but it's the cropped short grass of the roadsides where Spermophilus tridecemlineatus hangs out. Drive these roads on a warm summer day and keep an eye sharp, and you'll see 'em. Like chipmunks on steroids, the chunky little beasts race about and forage where the grass is low and the visibility is good. I probably saw ten or twelve this day, and the guy above allowed for an extremely close approach - something they normally don't permit. This is the sentinel. Thirteen-lined Ground Squirrels are highly social and well organized, and they always assign someone guard duty. The lookout watches for trouble, and should something like me appear, he utters a loud trill, sending the others into their burrows. To admire the stub-eared critter to full effect, click on the photo. I spotted this one from a few hundred feet off, and painstakingly, quietly, sidled closer and closer. It took about 15 minutes, but I eventually got within 15 feet without spooking him. He probably felt pretty safe; that's his burrow directly behind him. Sure enough, I took one step too much and quick as a wink the gopher shot into the hole. For kicks, I lay on my belly in the grass, about eight feet from the hole, to see what might happen if he re-emerged. After about ten minutes, I saw the grass rustle ever so slightly, and that flattened anvil-head with the huge almond eyes appeared, took one glance at me and vanished. Here's a short video of the ground squirrel. Sorry it's a bit shaky here and there. I was ever so slowly advancing as I shot the video, trying my best to be one with the squirrel, sending telepathic thoughts of peace and love so that he wouldn't wildly flee at the sight of the 250 pound bipedal monster. 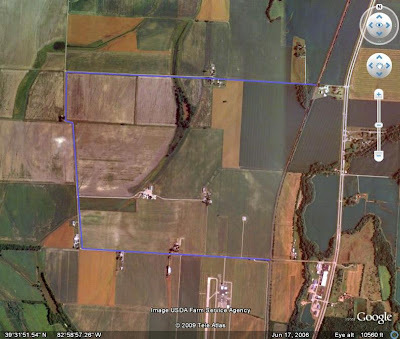 Should you find yourself in the Circleville area and like to see the Pickaway Plains and perhaps the Thirteen-lined Ground Squirrels, I've outlined a "gopher loop" in blue. Turn west on Radcliff Road off U.S. 23 a few miles south of Circleville. At the end of that turn left on River Road which will eventually return you to 23. Squirrels might be seen anywhere along the roadsides and around the county airport. Get 'em wil you can. Ground Squirrels are among our few mammals that truly hibernate. Come October, they disappear into those burrows for keeps, and like furry Rip Van Winkles down there they stay until April. Harlequin-patterned and ornate, Ruddy Turnstones rank high among my favorite shorebirds. They are also nice in that turnstones offer up no identification problems, something that cannot be said of some of their brethren. In fact, I saw the subjects of this blog while chasing a sandpiper that was reported as a Little Stint, at Conneaut Harbor, Ohio. As more details, and especially some exceptional photos, have emerged it has become apparent that the stint was actually a bright juvenile Semipalmated Sandpiper. Oh well, these things happen and stints/peeps are among the more challenging groups of birds to sort out. Gorgeous adult Ruddy Turnstone roots about the mud of Conneaut Harbor. Tame and confiding, turnstones often allow close approach. Breeding as they do in the highest reaches of the Arctic, they're probably not very familiar with people and may view us as large, strange, lumbering oddities rather than threats. Ah, the harbor at Conneaut is not exactly pristine wilderness. Populated by beer-swilling yahoos, trash-tossing cretins, and off-roading ATV'ers, the sand flats are lively on warm summer days. But the birds eke out a place amongst the detritus and rabble-rousers. These two parti-colored turnstones forage against the backdrop of a discarded Squirt carton, joined by three other species of sandpipers: Least Sandpiper, Semipalmated Sandpiper, and Sanderling. All are globe-trotters, and all will have traversed thousands of miles before the year is out. The above video shows a couple of foraging turnstones, and some of their beachmates. Pardon the wind noise - it is often breezy out there and my camera's mike is sensitive. The supporting cast includes Least and Semipalmated Sandpipers, Sanderling, and Semipalmated Plover. Turnstones are feathered piglets, at least in regards to their feeding mannerisms. Like ill-mannered little bulls, they rush around, rudely knocking other 'pipers aside as they snuffle about. Their bills are wide, flattish and spadelike, and the turnstones use them to great effect to cast debris and soil aside to uncover whatever delectables may be hiding beneath. Occasionally I notice other lesser beasts such as Least Sandpipers seemingly lurking close at hand, apparently taking advantage of missed treats uprooted by the turnstones. You can see several instances of the turnstones using their bills like a shovel, rushing some favorable spot and sending little explosions of sandy mud flying as they excavate the turf. I have watched Ruddy Turnstones find an especially attractive spot and excavate holes nearly as large as themselves. Even without the thrill of a stint, there were plenty of nice consolation prizes such as the calico birds. Today, Bernie Master and I made a marathon expedition to Conneaut, Ohio, to try and find the Little Stint that was found there yesterday by Craig Holt. For those of you that may not know the place, Conneaut is as far into the northeastern corner of the state as one can get, blocked in by Lake Erie on the north and Pennsylvania on the east. 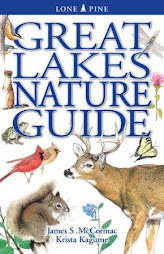 We didn't see the stint - it apparently was a one-day wonder as so many of the birds at Conneaut are - but we did see lots of other interesting species. The sand flats in the harbor allow for great, up close study of shorebirds and I got a lot of nice photos and decent video of a variety of things. The stint would be a state record, and one of very few records - maybe the first from the Great Lakes? - away from the coasts. Would have been great to see it, but misses come with the turf when chasing rarities. A small mob scans the swales at Conneaut, hoping that the stint magically reappears. It didn't but we had fun watching Ruddy Turnstones, Sanderlings, Least and Semipalmated Sandpipers, a Wilson's Phalarope, and other good stuff. I was pleased to see a number of fine specimens of the King of Terns flying about and loafing on the sands. This jumbo fish-killer was fresh in my mind, as I just received my new issue of Bird Watcher's Digest yesterday, and Caspian Tern is the cover species and feature story. Also, Caspian Tern is the logo bird for the upcoming Midwest Birding Symposium. If you aren't registered for that, please sign on and join the 700 or so fellow birders who have thus far registered. It'll be a blast and you shouldn't miss it. JUST GO HERE! Here's a short video of one of the terns lumbering about the Conneaut skies. I had the privilege of authoring the BWD Caspian Tern article, my fourth and hopefully not last feature for the mag. The others focused on Merlin, American Tree Sparrow, and Whip-poor-will. The tern was the most fun to write about, and it comes in a close second to the Merlin for sheer entertainment value in the field. "Being a fish has its ups and downs. On the pro side, life is a perpetual swim in a spa, the noise and abrasiveness of the terrestrial world muted by a cool watery shield. The ability to glide effortlessly about in a state of semi-weightlessness is another allure. For the most part, all is a bubbly bowl of cherries, softly filtered golden light gently amplifying silvery schools of fish gracefully navigating the waterscape. The con is death: sudden, horrifying, unexpected doom. And few greater terrors could exist for the scaly crowd than a Caspian tern. Imagine an emerald shiner, placidly drifting about, when POW! A sudden eruption shatters the tranquility of the depths as a bubble-distorted blur of white and red rockets through the water. Before the fish can react, that scarlet torpedo morphs into a ferocious bill attached to a brutish, winged sushi-eater. With a quick snap the minnow is plucked from the water. High in the air, the tern gives an adept flick of its bill, and down the hatch goes the fish headfirst, its world ended in one shocking instant, its fate now to return as guano. The Caspian tern is the world's largest tern, easily outweighing the other 44 or so species, and also stretching the tape in terms of length and wingspan. In a family of comparative prissiness—with names such as fairy tern, least tern, and whiskered tern—our protagonist is the gargantuan beast, a Goliath among a cast of Davids. It takes nearly 16 least terns—the world's smallest tern—to equal the mass of one Caspian tern. These black and white beauties even outsize many gulls. The gold standard for gull comparisons across much of North America is the familiar ring-billed gull, abundant from coast to coast. It's a big, can't-miss bird. But the Caspian tern is bigger. Its wingspan is two inches longer, and it outweighs the gull by nearly a half-pound. Thus, when they take to the wing and commence hunting, Caspians can't be missed. As hefty as gulls, they patrol on big, broad wings with their prominent scarlet-red bill angled down as they scan for prey. You may hear them before you see them, though. As befits the king of the terns, Caspians vent a loud, jarring croaking—RRRRAAAA—that carries considerable distances. If disturbed, they may issue the wonderfully named "gakkering" call (there's a Scrabble winner for you). Researchers Francesca Cuthbert and Linda Wires describe it in their Birds of North America monograph as a "vehement, rasping, ra ra ra-ra-rarau." However you describe it, gakkering often works to scare off intruders in the nest colonies—especially when combined with strafing by an angry cadre of pterodactyl-like giants with four-foot wingspans and blood-red bills the size of small cigars." 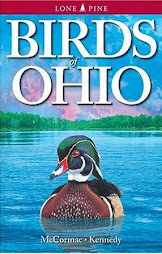 High time a bird showed up here; I was thinking I'd have to change the blog's name to Ohio Insects and Biodiversity. And we'll go with a charmer, a warbler that ranks high among many birder's favorites, I am sure. One of the "problems" of being an inveterate traveler that nearly always has a camera slung around his neck is that finding blog material is never a problem. In fact, I can never put anywhere near all the stuff that I, at least, find cool on here. I took the following shots back on May 23 at Magee Marsh Wildlife Area, and have intended to stick 'em up here ever since. Luminescent lemon beacon of a bird, a male Yellow Warbler takes a breather in between spirited renditions of Sweet Sweet Sweet I'm So Sweet songs. Although this, along with the Common Yellowthroat, is Ohio's most common and widespread breeding warbler, it is still a fascinating bird. This one is perched in a fine specimen of Sandbar Willow, Salix exigua, and Yellow Warblers seem happiest when in damp soggy places populated with plenty of willows. There are plenty of warblers that have yellow on them. This one is most deserving of having "yellow" as an official part of its name, though. No other warbler is so boldly sun-splashed as this one is, and the males are beautifully set off with chestnut streaking down the front. The scientific name is Dendroica petechia; the first part meaning "tree lover". Petechia is a commonly used medical term referring to reddish or purplish spots on the body, typically caused by minor hemorrhaging of capillary blood vessels. I guess the Yellow Warbler reminded Linnaeus of this malady when he named the critter back in 1766. Yellow Warbler nest, probably that of the bloke in the previous shot. A finely woven and intricately sculptured cup indeed. Unfortunately, the lovely couple chose to site it in a shrub of Morrow's Honeysuckle, Lonicera morrowii, one of our worst offenders in the non-native plant department. We have eggs, and GOOD NEWS! All look to be Yellow Warbler eggs. This species is heavily parasitized by Brown-headed Cowbirds, but, the warbler is much more clever than most. It is one of relatively few birds that can recognize cowbird eggs, and take action. Sometimes they'll just up and leave; in other cases the warblers will construct a new nest right on top of the one containing the cowbird egg. I remember seeing a photo somewhere of a stack of six or seven Yellow Warbler nests! Apparently neither cowbird nor warbler was quick to toss in the towel in that case. I hope that this nest successfully produced four warblers, which are now thinking of heading to tropical places if they're not already on the way. I went over to Miami County today on a whirlwind afternoon visit to a place called Greenville Falls. Located just west of Covington, at a point where Greenville Creek cascades over a gorgeous series of limestone shelves, the scenery alone is worth the visit. But for those of a botanical bent, it's the sheer 30-40 foot limestone cliffs that form the north side of the creek that are the attraction. The cliffs weep, constantly moisturized by water jetted from a perched aquifer, and harbor Ohio's only hanging fen. This plant community is most unusual and very showy, and the main reason I went. I'll try and share the place with you later, when there's a bit more time. But for now, a bug that I saw in the surrounding fields. I meet the inscrutable gaze of a Candy-striped Leafhopper, Graphocephala coccinea. Diminutive in the extreme, ten could probably have a party on your thumbnail. They're common, just easy to miss. But you don't want to miss anything that looks like this, and I would advise checking the foliage a bit more closely. There might even be one in your garden. Outrageous, and I am grateful for heavy-duty macro lens and a nice flash tower so that decent shots of wee fauna such as this can be passably presented. Candy-striped Leafhoppers stretch the tape to about eight millimeters. This is a Hemipteran, or true bug, and it makes its living by sucking sap from plants. They tap juice over a broad swath, too, ranging throughout much of the U.S. and southern Canada, and making it all the way down south to Panama. This leafhopper was photographed on one of our most reviled native plants, Giant Ragweed, Ambrosia trifida. The pollen of this species is the major source of hay fever. I encountered some stands of the ragweed today, and was amazed at the richness of the insect life within. We may not like ragweed, but apparently that's not true of bugs. It's been a whirl of things entomological lately, and I'm going to continue that trend with two more fascinating beasts. One of them, you know and probably fear. The other is a puzzler at first and makes for a good learning experience. As an aside, if you enjoy the outdoors and like to spend time in the field, start looking at insects if you don't already. As mid-summer rolls into early autumn, the bugs increasingly proliferate and their variety is staggering. Many are beautiful, and they all have fascinating life histories. Besides, insects are the fuel that makes much of the songbird world go 'round, and one can only get a better grasp of the feathered crowd by knowing more about their food! Last Sunday, Kelly Williams-Sieg and I ventured into Scioto Trail State Forest, and the very first stop proved to be quite productive. Upon exiting the vehicle, we quickly noticed that a nearby stand of Gray Dogwood, Cornus racemosa, was under siege by beautiful white and yellow "caterpillars". Just as would a good caterpillar, these larvae are making mincemeat of the dogwood leaves, stripping them down like a kid eating a cob of corn. Upon close inspection, the larvae are rather showy; almost gleaming white and granular as if they were wet down then dusted with powdered sugar. Smooth lemon-yellow underparts provide a nice contrast. I wasted a lot of time trying to find this thing in David Wagner's excellent book Caterpillars of Eastern North America. I figured that surely such a distinctive critter would be easily found in the caterpillar book, but it wasn't. Why? Because, it isn't a caterpillar! These are the larvae of a sawfly, which is a huge family in the Hymenoptera, which includes bees and wasps. This species is the aptly named Dogwood Sawfly, Macremphytus tarsatus. Sawflies are phytophagous, or plant-eaters. The larvae above has posed beautifully on a ripe berry of the Gray Dogwood, and there must have been a few hundred of his compadres chowing down on the plants. Growing side by side with the Gray Dogwood were several plants of Silky Dogwood, Cornus amomum. Fascinating to me was the fact that the sawfly larvae completely shunned this species, even though it is very closely related and was readily accessible. This just shows the great degree of chemical specificity required by many plant-eating insects. Adult sawfly - not Dogwood Sawfly, though - courtesy of the University of Minnesota entomology department. The larvae above will probably grow into something similar, at least the ones that make it to adulthood. I was delighted to encounter an active nest of Eastern Yellowjackets, Vespula maculifrons. The workers were industriously expanding the subterranean chamber, providing wonderful photo ops. You know this one, and so does nearly everyone that's been to a picnic. Yellowjackets have a sweet tooth and a propensity for sipping from the same soda can as you. More than one person has inadvertently swallowed one of these along with their gulp of Dr. Pepper and paid a painful price. When riled up, yellowjackets are formidable bugs and can deliver repeated nasty stings. By using slow, careful movements and laying on my belly I was able to get my lens right on top of the nest without unduly disrupting the excavation operation, or getting stung. Here, a worker emerges with a ball of clay. It was a constant procession of wasps carting out wee orbs of mud, flying them off to who knows where, and returning for more. Eastern Yellowjackets nearly always nest in ground burrows, and once a suitable site has been appropriated, they enlarge chambers for the actual nest. The nesting cavity is full of pulpy paperlike material, which the workers manufacture by chewing up and masticating plants. It was tempting to do a bit of excavating myself and lay the whole thing bare, but that'd hardly have been fair to the hard-working wasps. Plus, I will guarantee you I'd have been stung senseless if I'd tried that. Probably would have made for some good video, though. Here's a short video of the yellowjackets at work. Prepare yourself to enter the wonderful world of sedges, reader, a land shunned even by many a botanist. I know that the avid sedgaholics who follow this blog - both of them - eagerly await the following, though. Sedges get an undeserved bad rap. Part of this stems from their sheer numbers: there are over 160 species in the genus Carex alone recorded from Ohio. Factor in Eleocharis, Schoenoplectus, Scirpus, Cyperus and the various other sedge genera and that's a lot of stuff to learn. But in my view, if one really wants to understand ecosystems to the fullest extent possible, a good knowledge of the flora is essential. The plants are driving most of the other, animal life forms found in any locale. And sedges are VERY good barometers of habitat. Many species are quite specific to certain environmental niches, and can reveal much about the quality of the habitat that one is assessing. Plus, many of these sedges are just beautiful, and well worth more than a passing glance. This one may not look like much, but it is one of the best plant finds in Ohio in many a year. Hats off to Rick Gardner for this coup. It is the Giant Sedge, Carex gigantea, which is new to the state. Not only that, but one will have to cover a lot of ground to reach the closest populations. This site is not far from West Virginia, but the sedge as yet remains unknown there. Kentucky has a few sites in four of its southernmost counties, and Indiana has a few populations in three southern counties. This Ohio site, in Gallia County, is at least a hundred miles away from any other stands of Giant Sedge. Here's another extraordinary Gardner find from the same swampy floodplain woods. This specimen will be immortalized in an herbarium, but we took the opportunity to shoot images of the uprooted plant before bagging it. Lest you have concerns about harvesting a rare plant, there were lots of this sedge and they form extensive colonies. Collecting a sample like this harms it not in the least. This one is Louisiana Sedge, Carex louisianica, and this is the third known Ohio site. 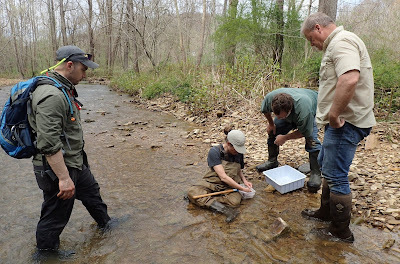 Like the Giant Sedge, the Ohio populations are considerably removed from other locations. Note the long subterranean rhizome, connecting two pieces of the plant. This growth habit is how it forms sometimes extensive colonies. The spikey mace-like fruit are above. Two of the rarest of the rare, growing side by side. Rick Gardner, on the left, kneels by a clump of Giant Sedge, and Ray Showman stands by a small colony of Louisiana Sedge. This is certainly the only site in Ohio where we know of such an occurrence, and it may be the only place for both anywhere north of the Ohio River. But WHOA - what's this?! We stopped in our tracks when this vigorous jumbo of a plant materialized from the gloom of the swamp. It didn't take long to realize that we were looking at a hybrid, and one that we didn't recognize. Sedges in general are pretty faithful to their own, and crosses are not common for the most part. That big grasslike tuft at the base of the sapling is the sedge - click the photo to enlarge - and the whitish-green spheres are the fruit. This is classic hybrid vigor - the cross outsizes either parent. A closeup of the fruit of the hybrid. To briefly wax technical, the entire unit is called the spikelet, and each unit of the spikelet (the pointed things) are called perigynia. Perigynia are papery bladders that contain the actual seed, or achene in sedge-speak. After some experience looking at these things, you can sort of tell a plant is probably a hybrid. The fruit have an unfinished empty look to them, and that's because they are. Hybrids typically have abortive, or undeveloped seeds, thus lending a weak hollow look to the fruit. I've dissected a spikelet for your viewing pleasure, and we can clearly see the individual perigynia. Normal sedges have the perigynia filled plumply with hard bony seeds. Not this hybrid. There wasn't a seed to be found. So how will it reproduce? It won't, at least this one. It's parent species are long-lived perennials and this luxuriant hybrid will remain as a clone, growing from rootstock. But it might live for decades, who knows? So, what is the thing? Well, we think we know. By analyzing the various elements of the hybrid, it looks to be a perfect cross between the aforementioned - and state-endangered - Louisiana Sedge and a much more common species called Gray's Sedge, Carex grayii. It should then be called Carex louisianica x C. grayii. The above photo also shows something typical of hybrid plants. The hybrid is growing just in front of that big tree by the sapling, just in front and to Ray Showman's left. The bare area in back is much wetter and has standing water for lengthy periods, and that's where the Louisiana Sedge is growing. And we found plenty of Gray's Sedge a bit higher and drier on more elevated portions of the floodplain. The hybrid splits the difference in regards to habitat. We'll look into this in more detail, and should be able to prove the hybrid's parentage. If it is what we think, such a hybrid has apparently never been documented so Rick and I may end up formally describing it. In my last post, about the spider-killing wasp, I mentioned the botanical foray that Rick Gardner, Ray Showman and I made last Sunday. We found many interesting things beyond that wasp, some we knew we'd see, others were new discoveries. The site that we explored was put on the botanical map earlier this year by Rick, who is botanist for ODNR's Division of Natural Areas. The fact that he found the place that we'll soon be trekking into via this blog is VERY impressive. Not only is it WAY off the beaten path, Rick is one of few botanists in the state who would have recognized some of the plants that we'll be visiting. 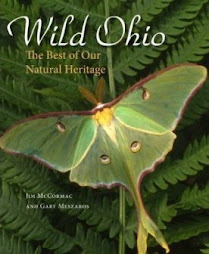 Ray Showman is author of the book Macrolichens of Ohio, the state's leading expert on lichens, and an all around great botanist. I've spent plenty of time in the field with these guys, and it is always a treat and I come away knowing much more than when we started. We found a fascinating hybrid sedge - hybrid plants often look better than do the parents - and it apparently was previously unknown. We'll get to that in a bit. 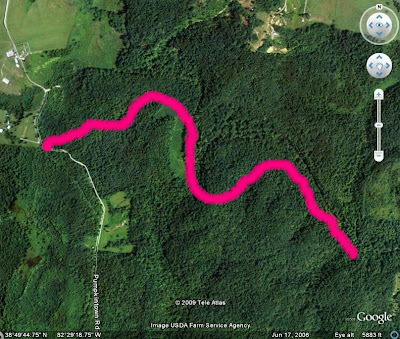 The pink line roughly traces the route we took through the backwoods of Gallia County, in part of the Wayne National Forest. From the narrow gravel lane, we traipsed over hill and dale, finally working our way back to some fascinating swamp forest and buttonbush wetlands along a stream known as Lick Run. The biggest of the buttonbush swamps. This wetland was pristine, with exceptionally clear water and dragonflies galore. I can't wait to get back in here and spend more time dragon-hunting. I'm sure there are some goodies awaiting discovery. If you've not been out much, the mushrooms are fantastic. Sparked by lots of rain this summer, the fungi have erupted to the surface and we saw many species in profusion. This old male Eastern Box Turtle was caught in the act eating one. Box Turtles are mushroom connoisseurs and can eat even the nastiest fungus with apparent impunity. This includes even the deadly Amanitas, supposedly. This one is dining on Russula emetica, sometimes called "The Sickener". If we were to eat it, we'd both vomit and suffer diarrhea. The ill effects aren't felt by Mr. Turtle and he had a woods full of Russulas and other spore-bearing goodies to chow on. We were excited to encounter this stunning wood borer, Cypriacis fasciata. It is one of the Buprestid beetles, same as the nasty Emerald Ash Borer, but this one is native and not a pest. Apparently next to nothing is known of the life history of this charming insect, and none of us had seen one before. Hot steamy days, such as was the case on this expedition, really bring out the bugs. This is a Net-winged Beetle, Calopteron reticulatum. They look a bit like milkweed bugs, but don't frequent milkweed and often are found in the shade of woods. It didn't take long to encounter our first rare plant. This is a giant member of the lily family, Featherbells, Stenanthium gramineum. We saw several of the threatened species, and the tallest were probably five feet in height. They have long grasslike leaves at the base of the plant, and the densely flowered inflorescences glow like beacons in the woodland gloom. The telltale six-parted flowers that characterize the Liliaceae can be seen here. Much more diminutive than the Featherbells was this Short's Hedge-hyssop, Gratiola viscidula. Another great rarity in these parts, but there were hundreds in and around the buttonbush swamp. It is only known from four southern Ohio counties, and in general is rare and limited in distribution everywhere in the nine or ten eastern states in which it occurs. Not the most exciting thing you'll ever see, but this is a very cool plant and among the rarest of the flora that we saw. Rick had discovered this species on a previous visit, and we found some more plants this day. It'd make a great quiz plant - bet you don't know what it is. Believe it or not, this is a bizarre aquatic fern known as Engelmann's Quillwort, Isoetes engelmannii. This is the third known Ohio population, and as you can see it grows in thoroughly saturated soil that is under water much of the year. The megaspores are found in sporangia contained at the base of the plant. Well, I don't want to make this a War and Peace of a blog post, so we'll return tomorrow for a look at some gorgeous and rare sedges, including the new hybrid.